You see, when we focus on attaining the things of this world, we are not putting God first in our life. God clearly says that He is not of the world’s ways. When we focus on attaining the things of this world, no matter the reason, this is an opening for evil to grab a foothold into our life, to reshackle us to it. Jesus Christ endured all that He did, to unshackle us from evil. Yeshuay unshackled us from that sin committed in the Garden of Eden, upon His Death on the Cross, for ALL OF MANKIND. This is why Jesus said, “Give up everything, and follow me.” As the Son of God, He knew what God wants of our lives, in order to be able to enter back into the Eternal Paradise. And we have to separate ourselves from the ways of this world, because they are not from God. This understanding or enlightenment can be seen in others who did not practice Christianity. Lets have a further look at this. Those who have claimed to be enlightened by a divine source, also demonstrated a life to which is similar to what Jesus Christ preached, which is a life, that is devoid of the worldly things, and to become humbled in knowing with each day that we live, we are in the very Presence of the Omnipresent Father of Creation. If we look at the lives of the Dalai Lama, Buddha, Mahatma Gandhi, Mother Teresa, Sai Baba, etc. (to name a few) they all lead lives that are devoid of the world’s riches and ways, in ways of love, peace, and nonviolence. And their path to seeking Divinity‘s Ways of Life, were the focus of their lives. Yes…nonviolence is very important in Divinity’s Laws of Life and Love. Why? Only the Creator has the right or jurisdiction, to create or destroy the creations. The creation does not have that jurisdiction to do that. This is why Jesus Christ said, in His Sermon on the Mount, “That I have come here to tell you, instead of “eye for an eye”, that you must “turn the other cheek.” When Jesus Christ was being taken away from the Garden of Gesthemane, the night before He was being crucified, by the Roman soldiers, St. Peter, took his sword to defend Jesus Christ from a soldier, and chopped off one of his ears. Jesus scolded him, and condemned for doing such a thing, and healed the soldier of the wound. Violence by any means justified in the wordly sense, is not justified by Divinty. God sees how far His Beloved Creations have come from the original greatness that He created for them to be. But He says, that those who have truly found Divine Enlightenment, will understand His Ways. Will understand the true value of the worldly ways. 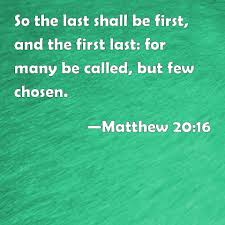 This is why Jesus said, “So those who are last will be first, and those who are first will be last.” –Matthew 20:16. Because God knows, just as His Son, Jesus Christ endured persecution and ridicule, since the time of His Birth on the earth; that evil will make sure that God’s Divine Laws of Love will be forgotten or never known by the many. But those who do know of it, and have found its true meaning, will not be accepted by the world. In fact, by the world’s parameters, they will be the “last”….they will be the “ridiculed” or least understood. Will not be “accepted” or “suppressed for the truth that they know”. But what Jesus demonstrated on the Cross was, that eventhough He was considered last on this earth….He is first in the Kingdom of Heaven, in God’s Eternal Paradise. That the ways of this world is not what defined Him, but the ways of the Divine Father of Creation. In this, with His SELFLESS SACRIFICIAL act of dying as the salvation for all of Mankind, from evil…He showed that Evil’s ways are temporary. And that God’s Wrath, is permanent. This entry was posted in Thoughts and tagged A call to help fellow man, Armor of God, Battling Evil, Christ, compassion, Dalai Lama, discernment, Divinity, Earth, enduring trials, Evil, evil ways are temporary, Faith, Fight over souls (good vs. evil), Garden of Eden, God, God's Love, God's Promise, God's ways are permanent, God's Wrath, Good vs. 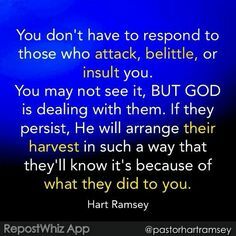 Evil, Gospel of Matthew, Jesu, Jesus, Jesus and His Crucifixion, Jesus Christ, Mother Teresa, Not "eye for an eye", Path to Truth, Persecution, Satan's deception, Spiritual Battles, Steadfast Faith, Turn the Other Cheek, Unconditional Love on November 21, 2013 by foodforthespiritualsoul. This very verse is stated in so many ways, and words by Jesus Christ. These are such powerful words, and often are overlooked by many who profess Love and Peace, as their philosophy. Those who have truly come to adopt Love and Peace, as their ways of life, will understand what God meant, when Jesus Christ ministered these very words to those He encountered. He also demonstrated this through His Own Earthly Life, as the Son of God. God does say that He is not of the world’s ways, but beyond them. He does not define Himself, by what His Creations determine as being “good” or “bad”. He, as the Creator, determines the parameters and the definition of what is “good” and “bad”. And those who are in tune with the Father of Creation, will also be guided to His definitions of what is good and bad. Just look at how a child is so confident in knowing what is right and wrong. Things are black and white to them. As the days go by, I sincerely believe that this is how we, as Man, were originally created to be…to know of what is right and wrong. The “gray” area was created by Evil. Evil’s biggest tools are confusion and chaos. God, as the Creator, always provides confidence and certainty. And this is what children display in their knowledge of knowing what is right and wrong. Has the world evolved to such a state, where we, as Man, are now confused, as to what is “right” and “wrong”, according to what God created for this world to be? As seen and described from the times of Adam & Eve, before Satan brought sin to the Garden of Eden, our world was created so that there was a Utopia, and perfect harmony. The world today evolved to its present state….why? Disharmony was introduced into Eden, upon sin being introduced…is the disharmony today, an extension of the 7 mortal sins of greed, gluttony, lust, pride, sloth, envy, and wrath ? Only God can tell us this, when the His Time comes to rule again on this earth. But God, as the Father of Creation; and Jesus Christ, as His Son, make it very clear that this world’s ways are not of the ways of Divinity…Let’s see how this is demonstrated…..
1. He was immaculately conceived to an unwed mother. Recent findings say, that Mary was even as young as 12 years old, at the time of conception of the Holy Spirit. 2. He was adopted by Joseph, who became Jesus’ earthly father. Joseph understood Mary’s Mission and his, by taking on such a role. 3. Jesus Christ was not born in a hospital, or in the home of his mother by nursemaids. Because word of the “King of Kings” birth was spreading like wildfire, He was being hunted to be killed. As a result, Joseph and Mary had to flee, and during their journey, Mary had to give birth to Jesus Christ in a barn, where He laid in a Manger, where cows ate their slop and food. 4. He lived humbly learning the trade of His adoptive father, Joseph, carpentry. He did not have a palace…or wear silks. He lived a humble life of the cloth that his mother spun for Him. 5. He roamed from town to town, to share God’s Gospel. He was the Shepard of God’s Lost Children. God, as His Father, guided Him, and always provided SUFFICIENT amounts of thing, in order to live from day to day. 6. He died the death sentence of a criminal. He did not die in what would be considered noble or royal. 7. And even when His Earthly Body was laid to rest, it was not in a royal ceremony; or mausoleum; but in a tomb made of stone. God went to this extent, to demonstrate through the life and death of His Son, how much earthly definition and parameters did not mean anything to Him, who sits in Heaven. In fact the worldly parameters are not needed to live a life that is pleasing to God, the Father. God has even said, through the teaching of Jesus Christ, that it is not only enough to follow the commandments that have been laid out. We must believe in them so much, as to live it, from day to day. That those that encounter a believer in God’s Love, will feel it so much, as to want to change from their old ways, to those ways that are pleasing to God. Jesus has said this very thing to the rich man that asked him this very thing. Jesus said, “Give up your riches, and follow me.” What did Jesus mean by this? He meant, that God is first in all. And if you believe that God is first, you will believe that He will always provide in sufficient amounts, just as He did for Jesus Christ. Because according the world He first created for Mankind, in the Garden of Eden, we did not need money or power. Man and nature lived in harmony with one another. This entry was posted in Thoughts and tagged A call to help fellow man, Adam & Eve, Armor of God, Battling Evil, Christ, Christianity, compassion, Dalai Lama, discernment, Earth, enduring trials, evil ways are temporary, Eye for an Eye, Faith, Fight over souls (good vs. evil), Garden of Eden, God, God's Promise, God's ways are permanent, Holy Spirit, Jesu, Jesus Christ, Love, Mary, Mother Teresa, Path to Truth, Persecution, Refiner's Fire, Satan, Satan's deception, Steadfast Faith, Turn the Other Cheek, Unconditional Love on November 20, 2013 by foodforthespiritualsoul.